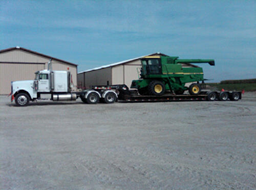 How is a Lowboy Trailer Different from a RGN Trailer? Trying to choose the right trailer to haul your freight can be a daunting task. Both Lowboy and RGN trailers are excellent for carrying tall and long freight, so, which will work best for your shipment? Lowboy trailers were invented in the 1920s and are unpowered trailers commonly used in hauling and transporting taller goods and items. 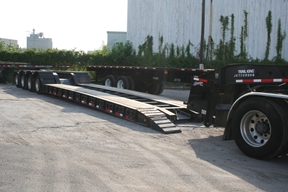 The items typically hauled by lowboy trailers are taller than the legal height of items that can be carried by flatbeds, and are usually industrial equipment like bulldozers. • Maximum well length: 24 ft. to 29.6 ft.
• Maximum well height: 18 in. to 24 in. • Maximum legal width: 8.5 ft.
• Maximum legal freight height: 11.5 ft. to 12 ft.
• Maximum legal overall load height: 14 ft.
RGN, or removable gooseneck trailers were invented in 1958 and are great for carrying long and tall freight. The front detaches, allowing the trailer to be lowered to the ground to create a ramp. For this reason, loads are typically driven onto the trailer, like trucks and other motorized equipment. RGN trailers can go up to 20+ axles, so they can carry freight up to 150,000 pounds. • Maximum well width: 8.5 ft.
• Maximum legal freight height: 11.6 ft.
As you can see, lowboy and RGN trailers serve a similar purpose. However, depending on your needs, one may serve you better than the other. If it would be easier to drive your shipment onto your trailer, RGN trailers would be a better fit. If you’re looking for something a little less expensive, a lowboy would be better, since RGNs can run you a bit more since they’re specialized.